Charlie Chaplin is one of those major figures of whom I know little about. I’ve been eager to fill the gaps in my classic film knowledge and it was essential that I learn about the man who has such an enormous impact on film history. Peter Ackroyd’s biography follows the life and career of this legend in a neatly packaged 300 pages. It’s not all-inclusive but seems to hit all the main highlights. Chaplin had a very difficult childhood growing up in London. Chaplin and his family lived in abject poverty, his mother was in and out of asylums and it’s not clear who is father was. Facts in the book are often presented with observations about the effects certain events in Chaplin’s early years affected his adult life. These observations also note patterns, influences, themes and symbolism later to be found in Chaplin’s work. He was poorly educated and what he learned was from experience. Ackroyd draws parallels with Chaplin to figures like Charles Dickens and Adolf Hitler. He also spends quite a lot of the book discussing in details Chaplin’s relationships with women. I learned many of the sordid details involved with the disastrous marriages to Mildred Harris, Lita Grey and Paulette Goddard. It was quite a relief to finally get to Oona O’Neill. Oona was Chaplin’s fourth and final wife. Their marriage was a mostly happy one. They were devoted to each other, had 8 children together and Oona was instrumental in helping him get through a major scandal. If you want to learn about Chaplin’s many films, there is plenty of detail here too. Films covered extensively include The Kid (1921), The Gold Rush (1925), The Circus (1928), City Lights (1931), Modern Times (1936), The Great Dictator (1940) and Monsiuer Verdoux (1947). Chaplin worked with Fatty Arbuckle, Marie Dressler, Edna Purviance, Rollie Totheroh (his principle cameraman for 38 years), Mabel Normand, Stan Laurel, Mack Sennett, Jackie Coogan, Virginia Cherrill, Marlon Brando, Sophia Loren among others. 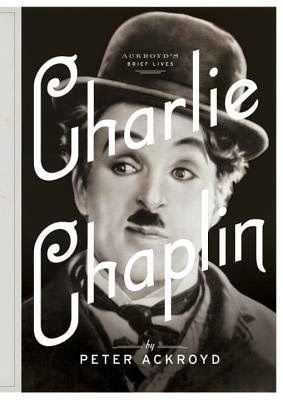 The author refers several times to Chaplin’s autobiography with the understanding that while it can be an unreliable source of facts it is also an insight into Chaplin as a person. Ackroyd navigates a minefield of mistruths, exaggerations and outright fabrications to get at the true story of Chaplin. Doing so he seems to capture Chaplin’s personality and it shows when reading the book. Chaplin was a man of many quirks. He was a loner, perfectionist, clean freak, a penny pincher and a fiercely independent man. Chaplin bounced from studio to studio and worked best independently. He was notoriously difficult to work with because of his controlling nature. There are good things about the book and bad things about it. I struggled reading it and was very disconcerted by Ackroyd sometimes judgemental tone. Structurally the book reads well. It sticks to a chronological timeline of Chaplin’s life and has a very approachable narrative. There is not much for extras in the book, it’s really just a straightforward biography of Chaplin. There are a handful of black-and-white photos throughout the book that are awkwardly placed and could have been more thoughtfully arrnaged. A small photo often takes up an entire page. I thought this was wasteful and unnecessary. Over the years I’ve become particular about photograph placement in biographies but this was just flat out poorly done. If this goes to paperback, I hope they’ll reconsider the placement of photos. Charlie Chaplin: A Brief Life is a primer on all things Chaplin. It’s a problematic book but does its job as a good introduction to Chaplin for those who are unfamiliar with him. Fans of Chaplin who are well-versed should look elsewhere or pick up this book solely as a refresher. Note: "A Brief Life" refers to Ackroyd's series of short biographies. It does not refer to the number of years Charlie Chaplin lived. Thank you to Penguin Random House for sending me a copy of this book for review! Charlie was one of my favorite Comedy Actor of classic comedy movies and series that he didn't need to talk but just the expression of his face, you will just laugh and laugh. I miss the classic comedy movies of Charlie. I enjoyed this book and thought it was well-written, even though I agree with you that Ackroyd's tone was rather judgmental. To me, Ackroyd was out to support the comment he quoted from Thomas Burke about Chaplin: "... he is first and last an actor. He lives only in a role, and without it he is lost. As he cannot find the inner Chaplin, there is nothing for him, at grievous moments, to retire into."